November 2016 Update: Samson Technologies discontinued the Airline 77 line which I carried for the last 8 years. I still support that system but do not have any remaining inventory. Samson have introduced the new and improved Airline 88 system, and I am proud to offer it to you. September 2018 update: The 600Mhz band will become illegal in 2020. More information in this article. Confused about wireless? BlowsMeAway can help. Get free of that cable! Roam the stage without tangles. Walk out into the audience for entertainment value, or to check you and your band's sound level. Enjoy a clear area under your feet. 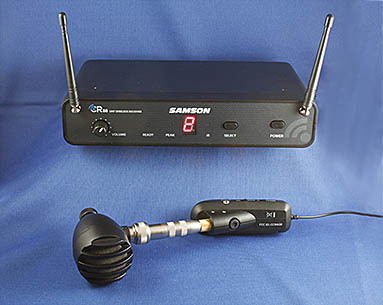 I am proud to offer these fine solutions based on wireless systems from Samson Technologies Corp. Samson has been designing wireless systems for over 30 years. These systems are small, lightweight and rugged. No belt packs required! What can you expect from BlowsMeAway? I have already tested and performed with these systems and found what works best with harmonica microphones. You can expect that I will answer all your questions to help you choose the system that is best for you. You can expect BlowsMeAway harp player-specific instructions along with the Samson documentation. You can expect that I will set your system up for you. You can expect that your transmitter will come with a Duracell battery installed. You can expect that if you have a special mic or connector I will find a way to make it work for you. Charlie Musselwhite started using a BlowsMeAway wireless system in early November '10. I just got home yesterday. I LOVE the wireless! Not one problem with it. Ever. It's great at sound check to walk out in front of the band and check the mix. I am VERY happy with it. Jason Ricci and Jackson Kincheloe (Sister Sparrow and the Dirty Birds) are two other pros using BlowsMeAway wireless system every night in performance. 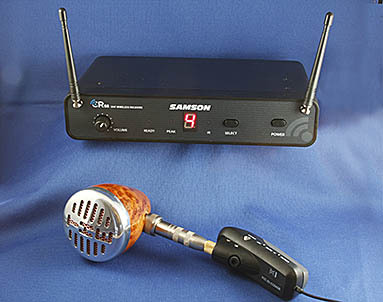 Samson’s AirLine 88 system offers true wireless freedom without the hassle of a beltpack or cable. Featuring a plug-in transmitter (No belt pack!) this frequency-agile UHF wireless system provides high definition sound, premium reliability and a 300’ operating range. It provides IR sync to wirelessly match the receiver and transmitter frequency, an audio Mute switch, battery life LED indicator and up to 12 hours of operation on a single AA battery. Offering frequency-agile operation, the system’s rack mountable CR88 Wireless Receiver provides 16 selectable channels for reliable performance no matter where you are. The receiver’s True Diversity design minimizes dropouts, while tone key technology prevents unwanted noise when your transmitter is off or out of range. The AG8 transmitter only weighs 2.5 oz (far less than the weight of cable from the mic to the floor) and has a 1 Mohm input impedance so it will work with crystal and ceramic mics with no impedance matching transformer required. All systems include power supply, rack mount hardware and instructions. (Rack mounting is not necessary - the unit has feet.) You need to supply the cable you will use to connect the receiver to your amp or pedal, or PA. For connection to amp or pedal, a standard guitar cable is all that is required. For connection to a PA, you will need a low impedance XLR to XLR cable. CR88 Receiver and AG8 Transmitter, Alkaline AA battery. Your microphone must be high impedance (dynamic or crystal), and have a 1/4" input or a screw-on connector. If you have a screw-on connector you will also require a Switchcraft 332A adapter ($14.95). Please advise when ordering. (Ultimate 57 shown. Ultimate 58 and Ultimate 545 also available. $199 - must be ordered with a Custom Wood Mic. Use these adapters to connect any high impedance microphone equipped with a standard 5/8" amphenol or switchcraft connector to either the Airline 77 AX1 or Airline Synth AX300 Transmitters above. 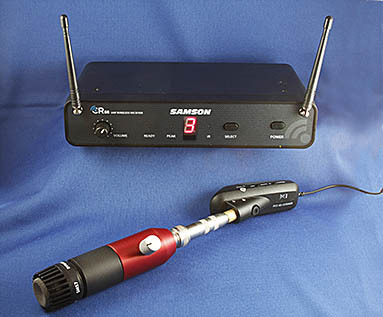 Dynamic/CR/CM-equipped mics are electrically compatible with the AX1 transmitter. 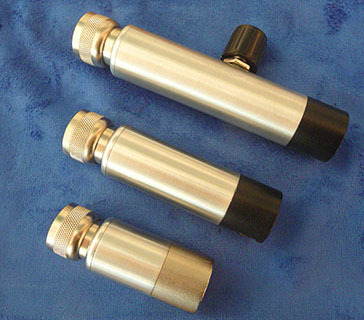 Crystal/ceramic element mics require an impedance matching transformer for best performance. Use this adapter to connect any high impedance microphone equipped with a standard 1/4" female connector to either the Airline 77 AX1 or Airline Synth AX300 Transmitters above. I can make adapters with any combination of connectors, volume controls and impedance matching. You have a choice of barrel color between silver and black, or colors for $10 more. 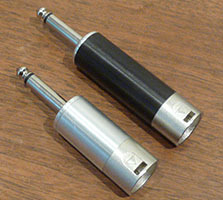 XLR connectors can be silver or black. Don't see what you need? Just ask! The CR77 and AR300 receivers provide both unbalanced 1/4", and balanced XLR outputs. I have found that the unbalanced output level is considerably lower than "mic level". This is not an issue if you are connecting the receiver to a PA or "clean" amplifier, or a pedal that boosts the signal into your amp. However to get the most "cable like" performance straight into a guitar or harp amp, I highly recommend you use an XLR cable and Impedance Matching Transformer to connect the receiver to your amp. Includes 10' or 18' (your choice) XLR Male to XLR Female cable and XLR-to 1/4" impedance matching transformer. This is a good thing to have in your gig bag - it is all you need to connect your low impedance mic to anything. For many years, BlowsMeAway Productions has only sold products I make. However I am frequently asked about wireless systems. There are no wireless systems specifically for harp, and information about adapting existing systems is virtually nonexistent. I decided to change that. After an exhaustive search, I concluded that the Samson line offered the best foundation. For the U.S. market, their systems are already migrated to new FCC approved frequencies. They have both amp-top/rack mount and pedal-based receivers. And their transmitters have the headroom required to handle the high output of harp mics. I have set up these systems and tested them with various mics. I have used them in performance. I am convinced these systems offer the best value to the harp player looking to go wireless. BlowsMeAway is now an official Samson Dealer. Please understand that I am doing this as a service to the harp player community. Given the "margin-free" price expectations of internet shopping, I don't make much money selling these systems. My motivation is simply to provide more complete service to you. However Samson requires a significant annual commitment from me, so in order to maintain dealership status I hope you will choose to purchase from me so that I may continue to offer this service. And please tell your friends! Please note that I can only offer systems that comply with United States law, on FCC- approved frequencies. If you reside outside the U.S. it is your responsibility to verify these systems are legal for your use, and operating on frequencies where you will not encounter interference, or cause it for someone else. Canada uses the U.S. FCC-approved frequencies. 10/28/17: Wireless mics and monitoring systems are currently allowed to operate from 470 - 698 MHz. In the next few years, FCC will limit operation to 470 - 608 MHz. While the majority of wireless systems in use today will be unaffected, customers with systems that operate above 608 MHz will unfortunately need to discontinue use and migrate to new frequency ranges. Update 6/10/17: The new Airline 88 systems I sell are legal and are in the 470-490Mhz band. The FCC remains vague about the 600Mhz band (Airline 77 systems operated in that band.) Here is an article that provides some useful information. 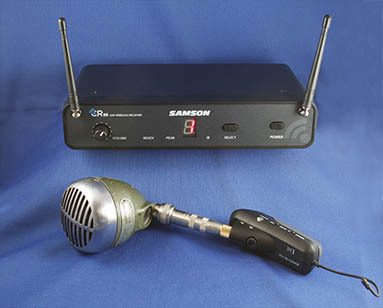 All Samson systems sold by BlowsMeAway wireless systems operate on the new frequencies allocated by the FCC for wireless microphone use.